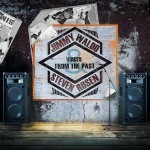 Share the post "Album review: JIMMY WALDO & STEVEN ROSEN – Voices From The Past"
Jimmy Waldo and Steven Rosen were a prolific writing duo at the height of hard rock’s popularity in the 1980′s and were two of the go-to-guys for songs. This writing partnership lasted more than 30 years and now over thirty songs they were involved in are gathered together to form this double album. The songs feature a host of talented musicians including Jeff Scott Soto, Autograph’s Steve Plunkett, Chicago’s Keith Howland, legendary session guitarist Tim Pierce, Black ‘N’ Blue’s Tommy Thayer and Jamie St James, Keel’s Marc Ferrari, Paul Shortino, Bob Kulick and many more. JK Northrup handled the mastering of the tracks. It is a mixed bag of styles, from the Heart like performance on ‘(Don’t Give Up) On Me’ by Mona Moore (a great, passionate singer who appears elsewhere on four other songs) through to ‘Phantom Of Passion’ by Phil Brown – his singing and the song sound uncannily like mid-80′s David Bowie. For those after some bona fide 80′s hard rock ‘City Of Angels’ hits the spot, complete with OTT guitar playing from Michael Angelo, although the 80′s electronic drumming may put some off. Jeff Scott Soto rips through ‘Ice’, with Black ‘N’ Blue’s Jamie St James rocking out on ‘The Other Side’. Similarly the three songs with Autograph’s Steve Plunkett will be sure to please fans. Plenty of songs on here you could imagine would have made an 80′s film soundtrack like the excellent ‘Blow The Beast’, with Greg Edelman on vocals. His other vocal on here, ‘Thinking Is A Dangerous Game’ follows a similar style. Jimmy Waldo does a new instrumental version of the Alcatrazz song ‘Islands In The Sun’, with parping keys to the fore! This entry was posted in ALBUM REVIEWS, ALBUM REVIEWS (Mobile), All Posts and tagged album, Alcatrazz, Autograph, Black N Blue, hard rock, Jeff Scott Soto, Jimmy Waldo, JK Northrup, melodic, melodic rock, review, Steven Rosen, Voices From The Past. Bookmark the permalink.